Snails, as pets, require very little attention. Their upkeep is easy. 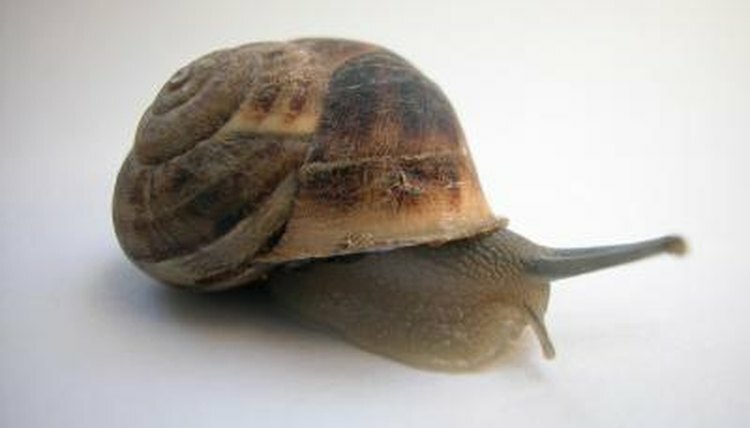 Taken care of properly, pet snails are hardy little creatures who can live up to 10 or 15 years. Snails thrive happily alone or in small groups, and are not territorial over space or food. A snail requires a clean and damp environment that is not too cramped. A large jar is big enough for a small species; a bigger snail will require an aquarium or a large plastic container. Cover your snail's habitat with a well-fitting lid that allows air to ventilate through; a snail will escape if the ventilation holes are too big. Line the bottom of the habitat with a mixture of compost, peat substrate and moss. Supply your snail with plenty of large leaves; a snail will spend most of the day hiding and emerge at night when it is cooler. Terrestrial snails are herbivorous. In the wild they consume bark, leaves, vegetables, fruit, fungi and algae. Feed yours fresh fruit and vegetables daily, making sure to remove leftovers from the tank before they begin to rot. Choice veggies are cucumbers, leafy greens including lettuce, apples and wild flowers such as dandelions. Wash store-bought veggies to remove pesticides and chemicals. Snails also require a source of calcium for their shells; provide a small piece of cuttlefish bone or chalk. Snails need moisture. Mist the habitat every day with warm water to provide a humid environment. Remove vegetation that has not been eaten from the day before, and open the lid of the aquarium to vent out carbon dioxide. Twice a month, clean out the entire aquarium, removing old substrate and feces, and wipe down the container with hot water; do not use soap or cleaning chemicals. Allow the aquarium to air dry before rehoming your snail. Snails are rapid breeders; they do not need mates to produce hundreds of viable eggs. Every three days, search burrows the snails have made in substrate for egg collections. Destroy the eggs by freezing them for 48 hours. Do not simply throw away snail eggs, as they can hatch and spread live snails into local flora, wreaking havoc on native vegetation. Handle snails gently by picking them up by their shells, and do not attempt to pluck them from the sides of their aquarium, as this can cause injury.